So, if you're a lover of US television it can be confusing to know when the shows you find using 'nefarious means' will be returning. Well, don't say we don't give you anything as here is our guide to the key dates of new and returning US programming. 8pm Dancing with the Stars (ABC) The 19th run of the US remake of the BBC institution includes the likes of Lea Thompson, Alfonso Ribeiro and Tommy Chong. 9.00pm New Girl (Fox) Return of the romantic comedy starring Zooey Deschanel. 9.30pm The Mindy Project (Fox) Return of the comedy fronted by Mindy Kaling. 9.00pm Red Band Society (Fox) Based upon the Catalan drama series Polseres vermelles, the series is a dark dramedy focused on a group of teenagers living together as patients in a hospital's pediatric ward. 8.00pm Madame Secretary (CBS) Tea Leoni stars as the Secretary of State, one of the most powerful people in the nation. After years away from the CIA, she is pulled back into the political arena where she gets things done, even if it means not always playing by the rules. She's tough, fair and smart driving international diplomacy and wrangling office politics. But when she goes home for dinner with her husband and teenage children, politics takes on a whole new meaning. 9.00pm The Good Wife (CBS) The superior law drama starring Julianna Margulies returns for a sixth season that sees Alicia Florrick running for States Attorney. 8.00pm The Voice (NBC) Gwen Stefani and Pharrell Williams join regular coaches Adam Levine and Blake Shelton for a new series of the successful singing competition. 8.00pm Gotham (Fox) Anticipated origin story of the DC Comics Super-Villains and vigilantes, revealing an entirely new chapter that has never been told. The series has already been bought by Channel 5 for broadcast in the UK and will be streamed on Netflix. 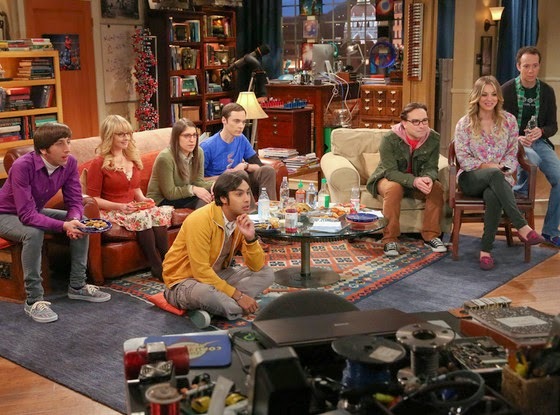 9.00pm The Big Bang Theory (CBS) The eighth series of the hugely popular sitcom that has been dogged with salary negotiations. The new series sees Penny leave acting behind her to become a pharmaceutical rep which sees her her earning a lot of money. 9.00pm Scorpion (CBS) New drama inspired by a true story, of Walter O'Brien, a genius who recruits other geniuses to help solve complex problems of the world. 9.00pm Sleepy Hollow (Fox) Return of the fairy tale drama. 10.00pm Forever (ABC) New comedy that stars Ioan Gruffudd as a man who keeps coming back from the dead. 9.00pm NCIS: New Orleans (CBS) New spin-off of the long-running crime drama. 8.00pm Mysteries of Laura (NBC) Comedy starring Debra Messing as a policewoman who struggles to leave her job behind and become single mother to her twin boys. 9.00pm Modern Family (ABC) Sixth series of the award winning family comedy. 9.30pm Black-ish (ABC) New comedy starring Anthony Anderson as a father who begins to worry maybe his family have assimilated a little too much into their suburban lifestyle. 8.30pm Manhattan Love Story (ABC) Romantic comedy that uses inner voices to hear what the characters are thinking. 10.00pm Stalker (CBS) Drama series centring around detectives who investigate stalking incidents – including voyeurism, cyber harassment and romantic fixation – for the Threat Assessment Unit of the LAPD. 9.00pm Bad Judge (NBC) Comedy starring Kate Walsh as an out of the control court judge. 9.00pm Gacepoint (Fox) US remake of ITV's Broadchurch starring David Tennant and Breaking Bad's Anna Gunn. 9.30pm A to Z (NBC) New romantic comedy. 9.00pm Homeland (Showtime) Fourth series sees Claire Danes character work undercover in Afghanistan. 8.30pm Cristela (ABC) New comedy centring around a Mexican family. 9.00pm Jane The Virgin (CW) Comedy that will detail the surprising and unforeseen events that take place in the life of Jane Villanueva, a hard-working, religious young Latina woman whose family tradition and a vow to save her virginity until her marriage to a detective is shattered when a doctor accidentally artificially inseminates her by mistake during a checkup. 9.00pm Marry Me (NBC) Single camera comedy that follows what happens to longtime couple Annie (Casey Wilson) and Jake (Ken Marino) when their deeply committed relationship turns into a long and bumpy ride on the way to altar after the question of "Will You Marry Me?" is popped. 10.00pm Constantine (NBC) Action series based on the characters appearing in the comic series Hellblazer published by DC Comics under their Vertigo imprint. The series will star actor Matt Ryan as John Constantine. 9.30pm The McCarthys (CBS) Family based comedy. 10.00pm State of Affairs (NBC) Drama starring Katherine Heigl as CIA analyst Charleston Tucker who is tasked with assembling and presenting the President's Daily Briefing on the most vital security issues facing the country, and Alfre Woodard as first black female President Constance Payton, who, in a different world, would have been Tucker's mother-in-law. So there you have our comprehensive guide to the 2014-2015 American fall season. Now do we want to take bets on which ones will last the season?